Perth 2011 Event Director John Longley today announced the dates of the major test event for the Perth 2011 ISAF Sailing World Championships. Mr Longley said he expected a significant number of the 80 countries that will compete at Perth 2011 to register for the test regatta, which will be held one year out from the World Championships. The Perth 2011 ISAF Sailing World Championships will be held between 3-18 December, 2011 and is an Olympic qualifying Event for London 2012. 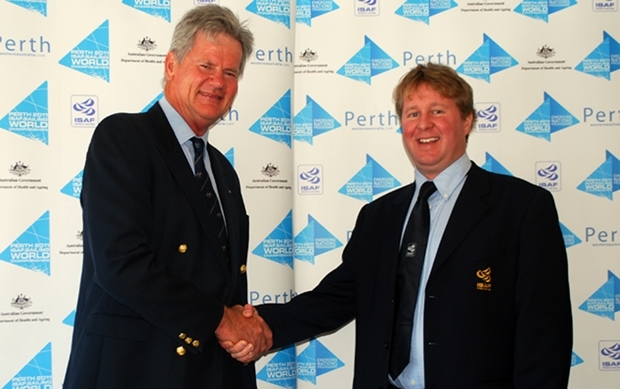 Yachting Australia Chief Executive Officer Phil Jones, who was in Perth last week, endorsed the dates of the regatta. “The regatta dates have been set to avoid conflicting with the Sail Down Under Series in Brisbane, Sydney and Melbourne and yet close enough to the Perth 2011 dates to be relevant to organisers and competitors,” said Jones. ISAF Events Manager Alastair Fox, who was also in Perth last week, was also delighted with the announcement: “The Perth International Regatta will provide a great opportunity for Event organisers and ISAF to prepare for the Championships. Race Management, logistics and sports presentation will form the main focus for the Perth International Regatta (test event). The announcement of the regatta highlights the commitment of the Perth 2011 team to deliver a fantastic World Championship in December 2011.